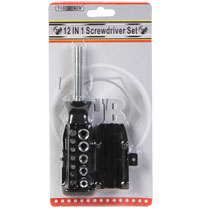 TOOL INCLUDES: Screwdriver tips (3 different sizes each of flathead & Phillips),a socket adapter,5 sockets (5/32”,3/16”,1/4”,9/32”& 5/16”)YS- 3mm AND 1/8"
Easy snap handle holds all piece. SAVE TIME & $ ON PAINT SUPPLIES ! ONLY $3.99 (was $8.99). PIANT TOOLS DISCOUNTED OVER 50% ! One tool for so many tasks! With its handy sockets and socket adapter, plus set of various screwdriver tips, this multipurpose 12-in-1 screwdriver will soon become your go-to tool. Conveniently stored inside the handle are a wide assortment of screwdriver tips (3 different sizes each of flathead and Phillips), a socket adapter, and a set of 5 sockets (5/32”, 3/16”, 1/4”, 9/32”, and 5/16”) — everything simply snaps into the end of the tool for quick use. Perfect for kitchens, laundry rooms, college dorm rooms, emergency car kits, tool belts and boxes, and travel.